I’m not a fan of beans, but when it comes to red red I am head on! Stewed beans is a traditional West African recipe, but I’m introducing the Ghanaian style with a twist. The reason I like this recipe is because of it’s character. The mix of onion, tomatoes and peppers in organic African palm oil orgasmic. I could not explain the mix of flavors. It was so good that it put me to sleep. Growing up, I didn’t like beans. It was one of those meals I chose to sleep and forget. My mother made my siblings and I eat beans under the guise that it would make us tall. As mommy I believed everything she said. When people tell me that they love beans, my reaction is always “and so?” Like “why?” why would anyone eat or even have beans as their favorite food? Is the world that sad? Until I had red red. I cannot explain how it feels to prepare and eat this dish. Apart from the Nigerian beans pottage, this is the only way I really like beans. 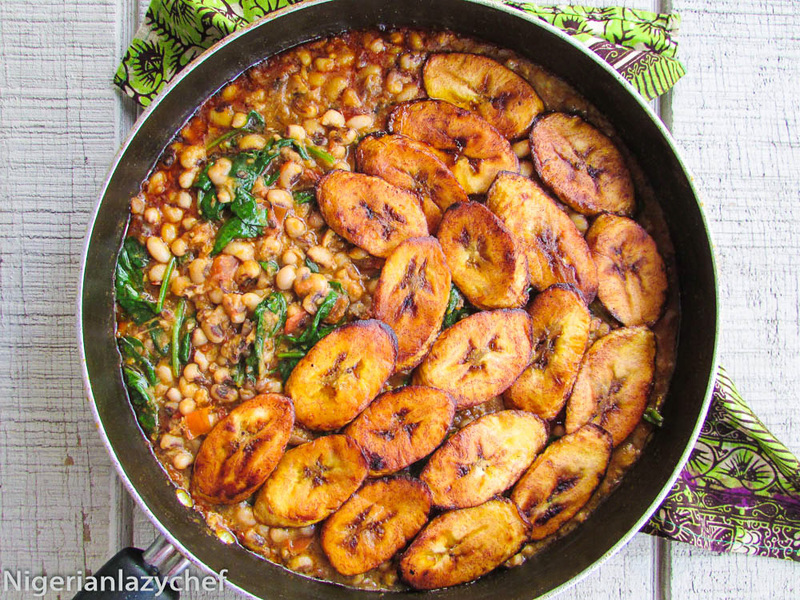 and with plantains, this recipe is every every everything! Apart from the fact that I really like this recipe, I love the fact that it celebrates the similarities between Ghana and Nigeria. And with celebrating the success of this recipe, I added a little twist and it was spinach. 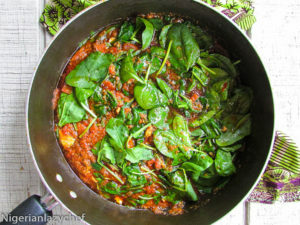 I have been quite anemic and with my doctor telling me to eat more iron filled foods, I kind of add spinach to everything and this recipe was no exception. The only thing is that…adding the spinach actually worked! It worked! It worked! and here I am sharing this recipe with you. Hoping that you really like it and share it with your family. Wash the peas and place into a pot. Bring to a boil; then place under running water and wash. Place into a pot and add half of the onion. Do not season. Cook until soft then set aside. Chop the tomatoes and set aside. Blend the remaining onion, garlic, habaneros and bell pepper. immediately add the peas so that the spinach does not over cook. If you don't like or have sardines, you may use any type of fish. Just steam the fish with salt, pepper and onion and add into the beans. This entry was posted in Bean recipes, Beans, Eating Healthy, Gluten free Nigerian, gluten free nigerian recipes, Gluten free recipes, Healthy Eating, Healthy Nigerian, Healthy Nigerian Dishes, Protein, Protein Dishes, Uncategorized and tagged african stewed beans recipe, beans, black eyed peans, ghanian stewed beans, How to cook African peas, how to cook black eyed peas, Nigerian food blog, Nigerian stewed beans, red red, stewed beans, stewed peas. There were no plantains mentioned in the recipe! ?